CCOM/JHC is collecting multibeam bathymetry and acoustic backscatter data that can be used to support an extended continental shelf under Article 76 of the United Nations Convention of the Law of the Sea (UNCLOS). 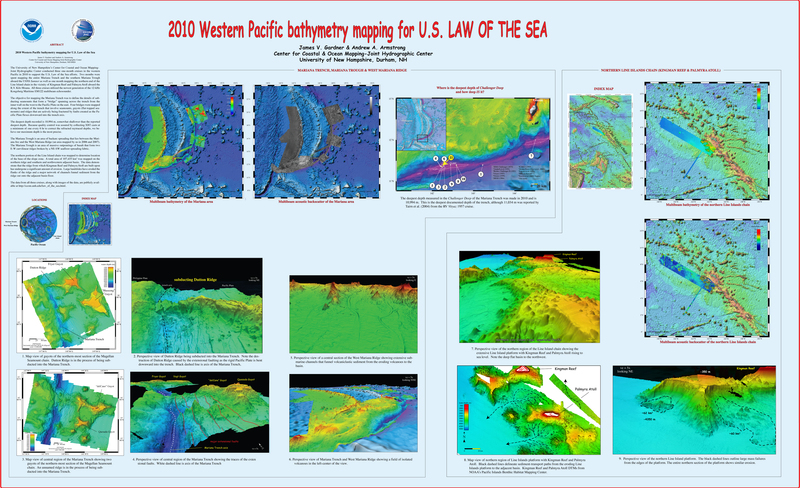 The extensive seafloor mapping project grew out of an exhaustive desktop study of the U.S. bathymetry data holdings and identified several regions where new bathymetric surveys are needed (Mayer, et al., 2002). The report emphasized that multibeam echosounder data are needed to rigorously define (1) the foot of the slope (FoS), a parameter of both UNCLOS formula lines, and (2) the 2500-m isobath, a parameter of a UNCLOS cutoff line. Both of these features, the former a geomorphic feature and the latter a geodetic position, can be used to define an extended continental shelf claim. For more information about the national effort to establish the full extent of the Continental Shelf of the United States visit the U.S. Extended Continental Shelf Project website. To view more information on any of the survey sites click on the area on one of the globes above, or choose the site from the list below.